You need to remember that the examiner is not your enemy. It’s the examiner’s responsibility, in an oral exam, to provide opportunities for the examinees to display their language proficiency, how good they are at speaking. So the examiner will help you. So our second top tip to help you with your speaking exam is to remind you that the examiner is there to help you! They know you're nervous. But it's also good to give yourself the best possible chance as well. Don't speak too fast – slow down – take a deep breath and speak clearly. And don't forget to listen to the questions and if you're unclear, ask the examiner for clarification. This is because it’s important to interact and show the examiner that you can’t just speak, but you can actually converse with someone else. Part of your marks will be devoted to the interaction between you and your partner, so remember to react to what your partner says and to ask questions if it’s appropriate. So remember in speaking exams, the emphasis is often on co-operation rather than competition. If you're confident and friendly you'll do well. Good luck! 2: The examiner is not your enemy! How can you be prepared for your speaking exams? You want to speak correctly. Which way can help you prepare for a speaking exam? You need to make sure you understand what's being asked. If you don't understand something in the exam, what should you do? How do you show you understand what someone is showing? What should you do when working in pairs or groups? Does the examiner really want you to fail? In a speaking exam, what is the role of the examiner? Our BBC Learning English series Better Speaking can help you become a fluent, confident speaker of English. This BBC Skillswise website can help you formal and informal speaking. 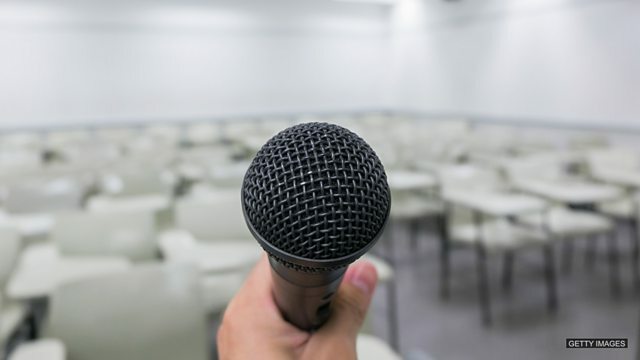 This BBC News story talks about how to overcome a terror of public speaking. Join us in Session 2 for News Review, where we'll bring you key words and phrases from the latest stories and show you how to use it in your everyday English.